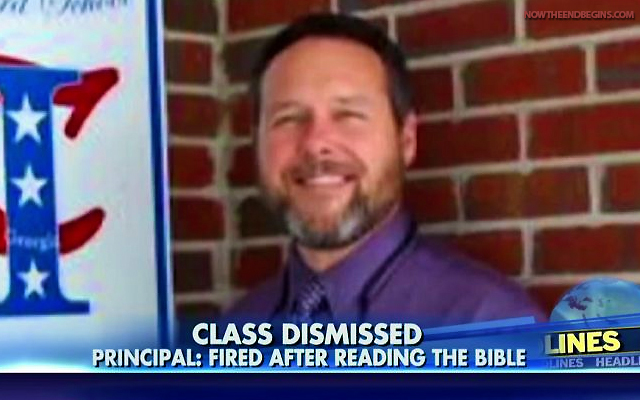 A Georgia high school principal says he was fired after he read the Bible and prayed with a group of students during a volunteer Christian group meeting. EDITOR’S NOTE: Since Obama has been president, the rise of persecution against Bible believing Christians is off the charts. From bakers and florists who have been bankrupted for not servicing LGBT weddings, to school teachers being fired for reading the Bible, the climate in America has changed. Soon it will be illegal to hold a bible study, even in your own home. This is what the future looks like in Obama’s America. Manchester High School principal Dr. Michael Lehr reportedly was just filling in for the leader of the Fellowship of Christian Athletes organization during a meeting. Regardless, the school district superintendent put him on indefinite administrative leave just two days after the meeting and informed him that his contract would not be renewed.